Banning Protest – Is it right? The English Defence League has been denied permission to carry out their planned march through Tower Hamlets, an area of London with a high Muslim population. A wide coalition of local political figures, Muslim and LGBT groups and others asked Theresa May, the Home Secretary, to instigate a ban. The Scottish Defence League, an offshoot of the English Defence League, has been refused permission to march in Edinburgh on the anniversary of 9/11. Is it right to ban them? 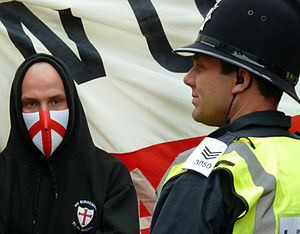 The English Defence League is an infamous, far-right, street protest movement. It organises demonstrations in protest of what it sees as the spread of Islamism in England. It grew out of various firms of football hooligans, around 2009. They had planned a rally in Tower Hamlets, which has recently been prohibited by Theresa May, the Home Secretary. The Scottish Defence League is effectively an offshoot north-of-the-border. It was planning a rally in Edinburgh on the 10th anniversary of the 9/11 terrorist attack in the US. They notified the council that they intended to march from the vicinity of the American consulate to the east end of Princes Street, a distance of around half a mile. They were denied permission by Edinburgh City Council, after opponents to the march claimed it was a threat to public safety. I have been thinking a lot recently on the subject of whether it is right to block such protests. I can see good arguments on both sides, that it is a danger to society, and also that we need to tolerate this in order to defend freedoms of speech, assembly and expression. My inner totalitarian, I fear, is winning out. The part of me that believes we need to force others to believe what we believe, in order to guarantee greater freedoms for all. Preventing the EDL airing their views allows Muslim, Gay, Jewish and left-wing members of Tower Hamlets and Britain to live in peace. Isn’t that more important? To abide by a certain set of laws, even to outlaw some viewpoints, in order to build a society for all? But that argument doesn’t convince even me. Who am I to choose what is right? Even if I sacrifice my positions for the majority, which is how society surely structures itself, where do we draw the lines? I cannot decide that. So I relinquish that fight. For now. But there is justification for banning these demonstrations. There is a way to reconcile banning the demonstrations, while still defending basic human rights such as freedom of speech or the freedom of assembly (or association, there is a large discussion to be made about the difference between those two rights). It’s because banning them has nothing to do with freedom. We’re not banning the EDL itself. We’re not preventing them from assembling as a rule. We’re not disassembling them as a group, though some may say we should. We are still allowing their websites, twitter feeds and facebook pages. We are not stopping their recruitment. If they keep to the anti-Sharia agenda the organisers claim, as opposed to a neo-Nazi agenda propagated by Combat 18 and similar, then there should be no reason to. But in THIS instance, they are not, for example, protesting in front of Parliament, or in 100% Caucasian areas. They are trying to march in an area which is full of Muslims, in an area which has actively stated its animosity to the EDL. What can this be if not actively provoking a reaction? While I don’t agree necessarily that all EDL/SDL or any other far-right group is solely comprised of hard-core racists spoiling for a fight (and the converse, that Unite Against Facism is full of non-confrontational pacifists), I do believe that such rallies are designed to provoke violent reaction, even if not to instigate it themselves. They are often located in areas where there is already tension and uneasy peace – look at EDL vigilantes recent march through Enfield towards the end of the recent riots. I can see no real reason for such actions except to provoke a response, and to trigger a clash, even just to serve the interests of a minority of the group. The ban also doesn’t prevent them from going to Tower Hamlets – a static protest is still allowed. They are welcome to go, air their views, away from residential areas where people could come under threat from violence… from any side. They are not, and cannot, be prevented from airing these views. But to allow them to march where they please in areas known to be unwilling to host them, is silly, when it can only, surely, be provocation. Isn’t it? When we take that this IS a group dedicated to provoke violence, we can argue to get the validity to ban other protests by the group, such as the one in Edinburgh. If the membership is one that knowingly provokes a violent response to their marches, then they can be prevented elsewhere, surely? Possibly? Not sure on that one. Not sure on Edinburgh, yet. Not sure on much of this. I think I’m right, but it still rests uneasily on my conscience. Await many more posts on this topic. « Steve Jobs, You’re fired!